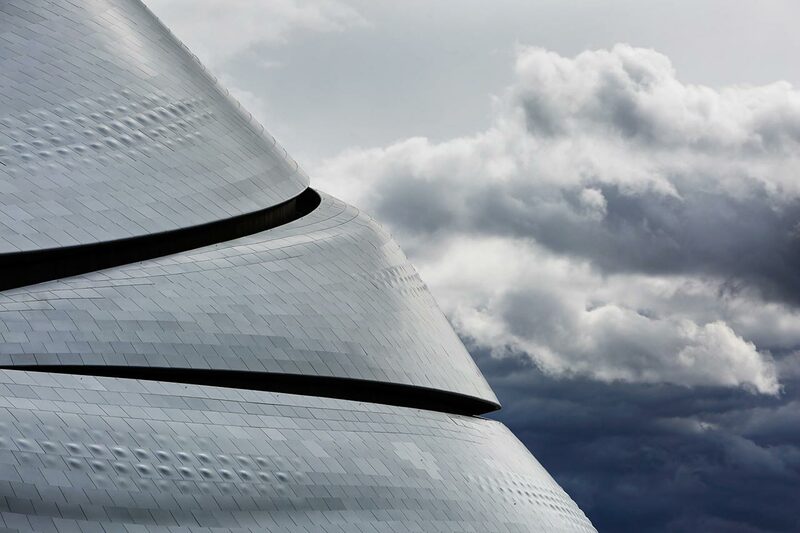 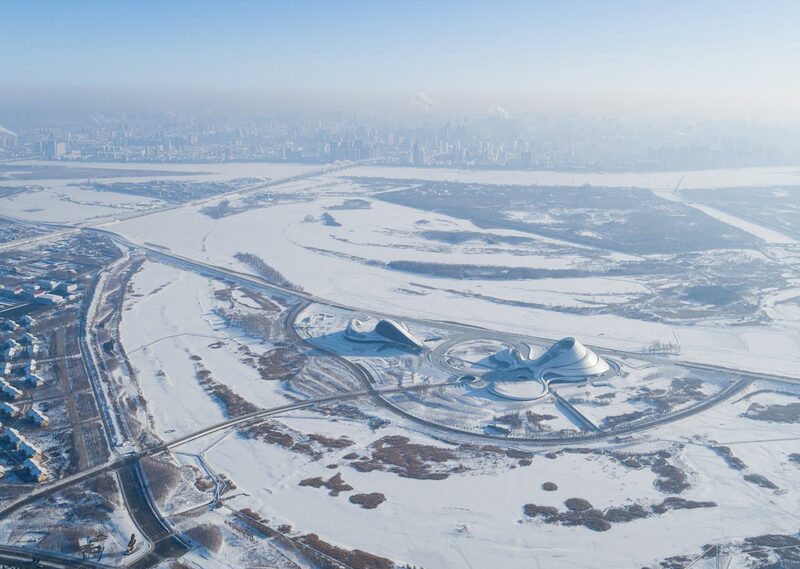 Rising from the wetlands like a sinuous ice formation that has been sculpted over time by wind and water, the Harbin Opera House is undoubtedly a new landmark on the skyline of the Chinese northeastern city of Harbin. 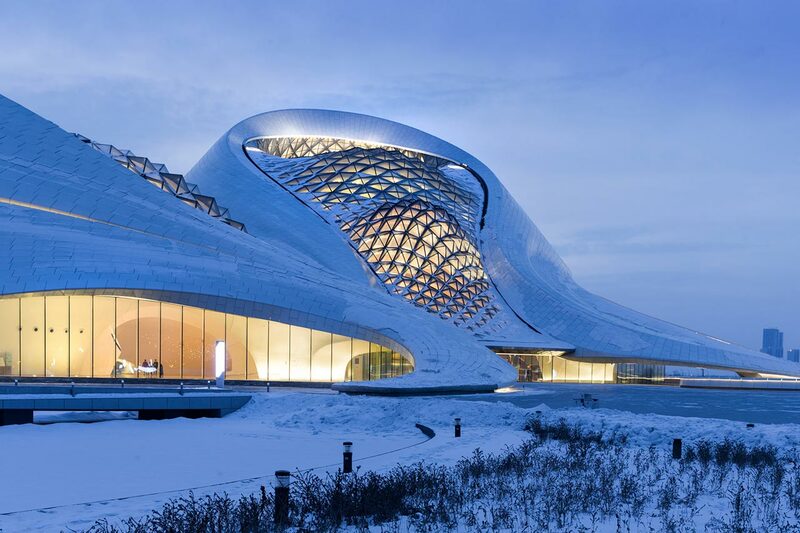 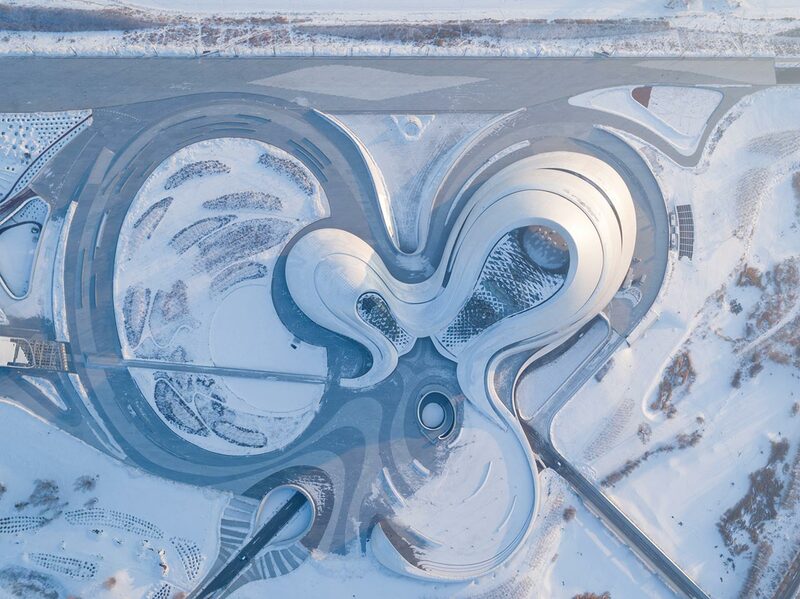 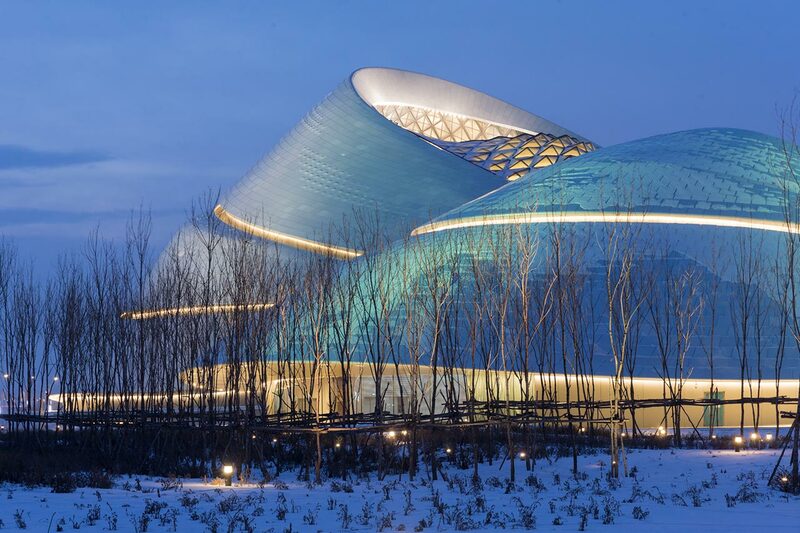 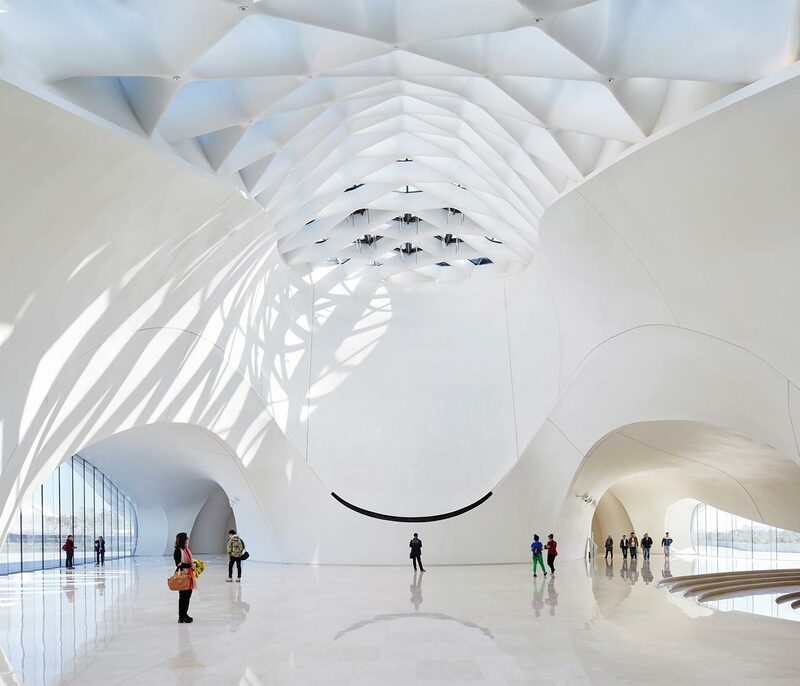 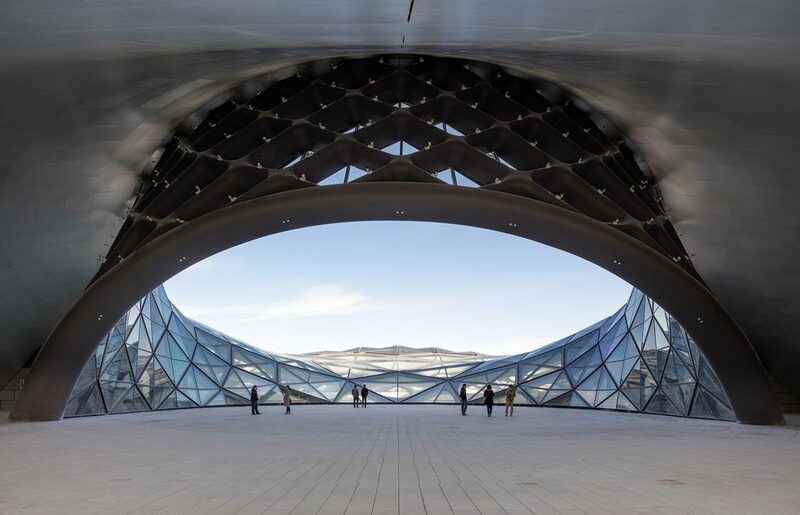 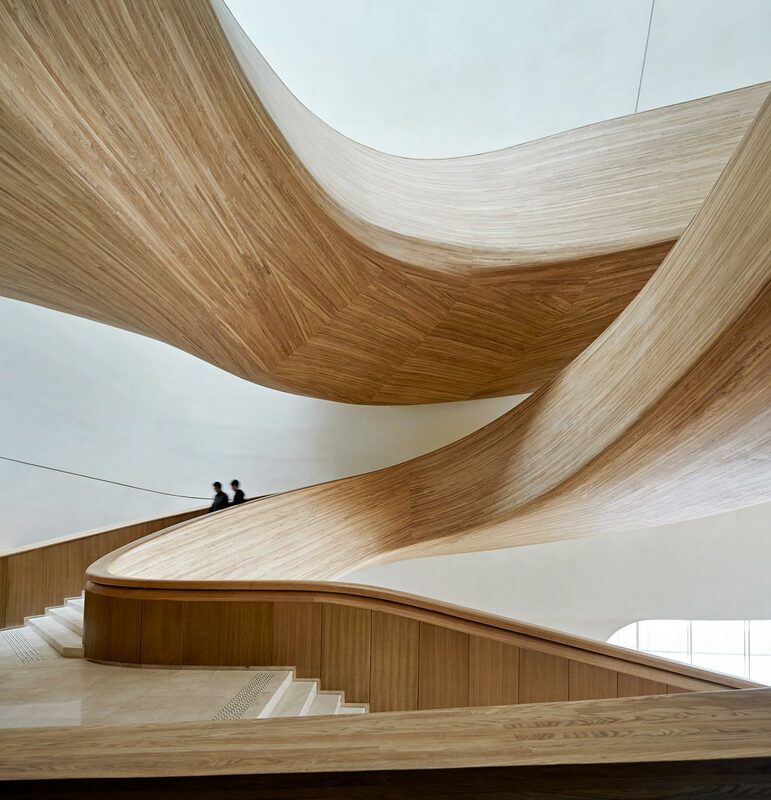 Designed by Beijing-based MAD Architects as a creative response “to the force and spirit of the northern city's untamed wilderness and frigid climate", the building is a sculptural tour de force that organically blends into the horizon. 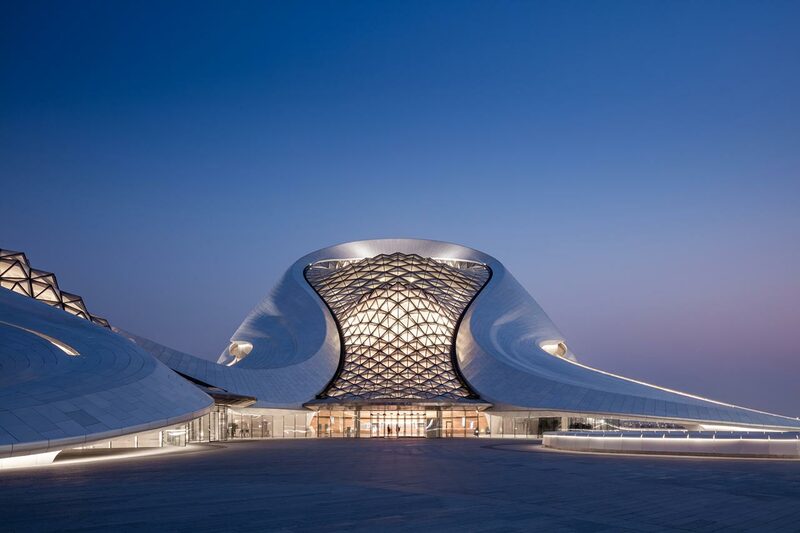 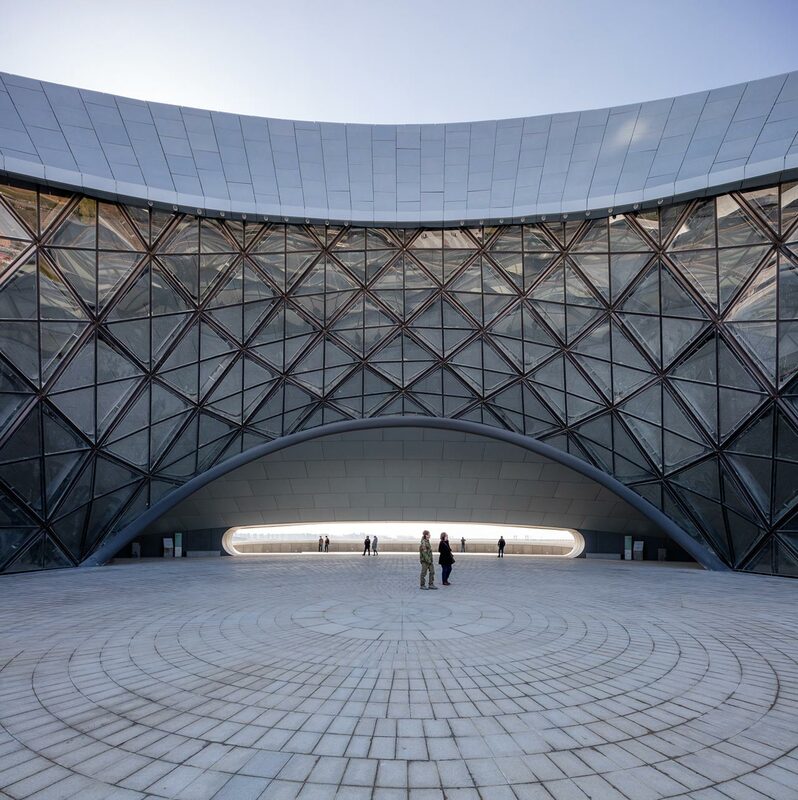 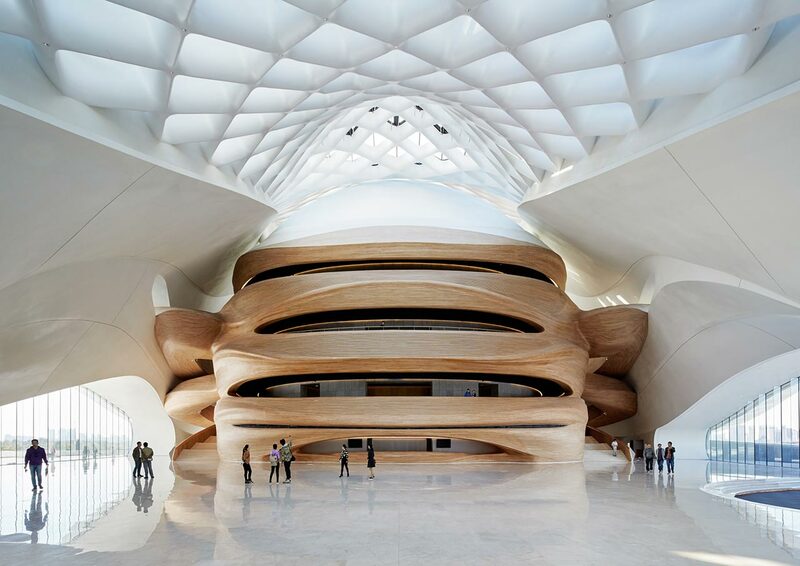 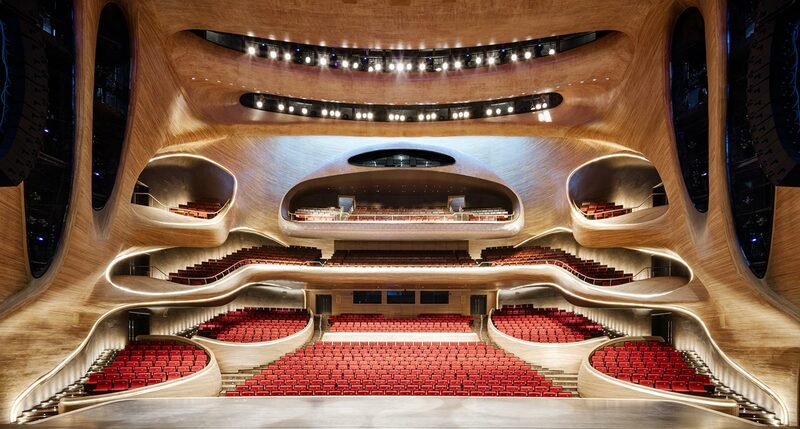 Part of Harbin Cultural Island, a major new arts complex located on the wetlands of the Songhua River, the new Opera House contains three distinct focal spaces that form a three-petalled plan: a grand theater with seating capacity for 1,600, a smaller theater comprised of 400 seats and a large public plaza. 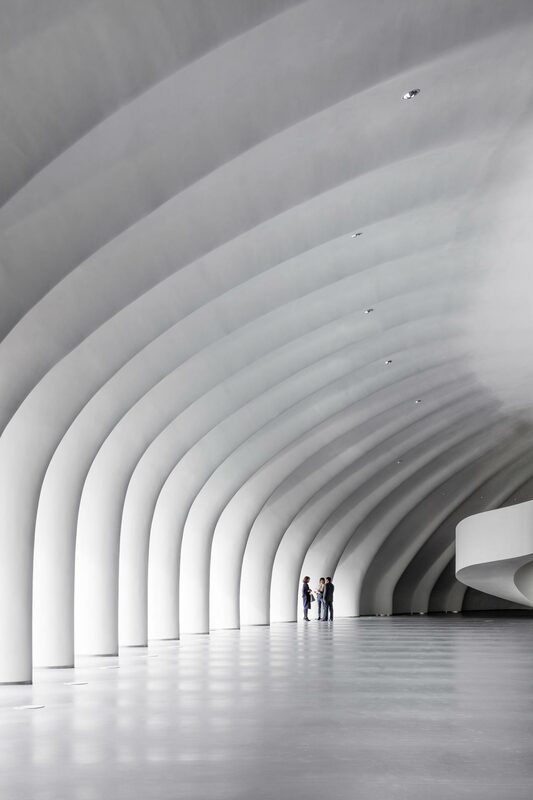 All three sections are bound together by an undulating surface composed of smooth white aluminium panels that fluidly wraps around them mirroring the waters of the surrounding marshlands. 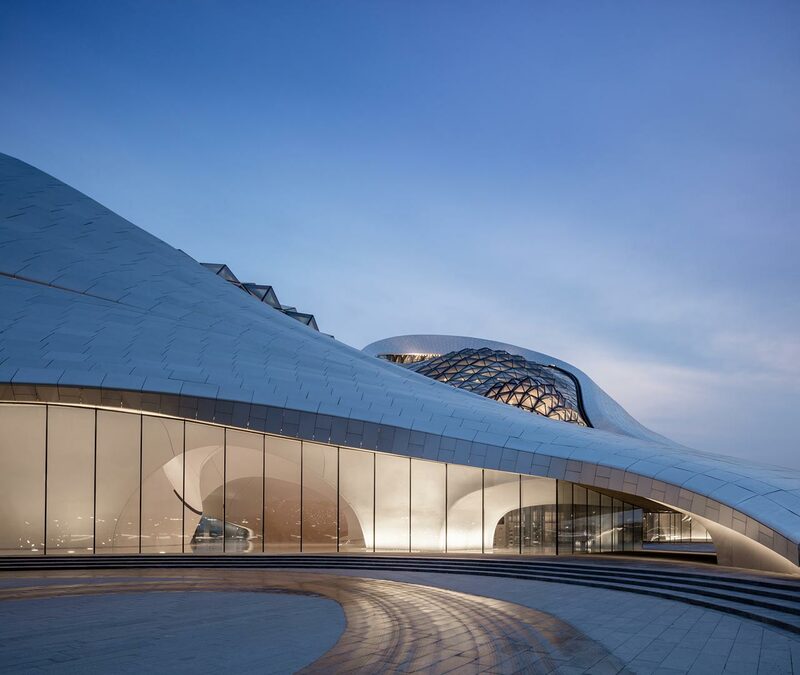 Meanwhile, the smooth white texture of the billowing shell is juxtaposed with the faceted rooftops that crown the two theater volumes with an array of glass pyramids. 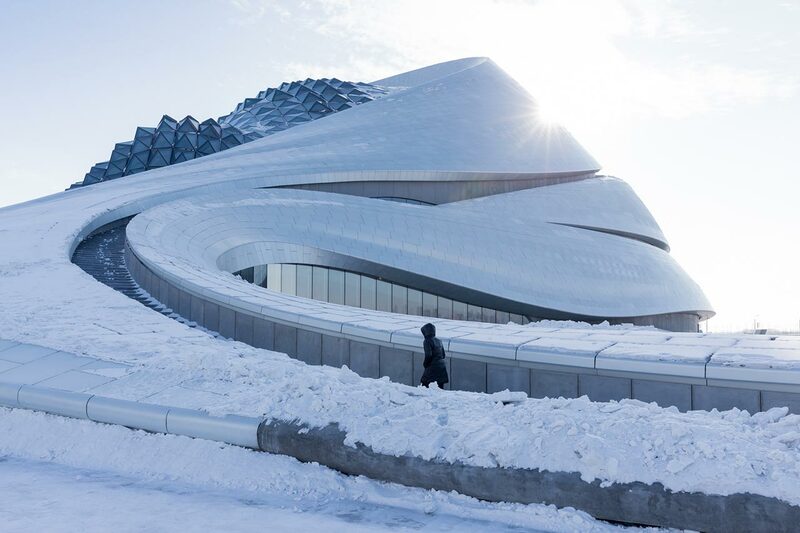 The combination of the smooth with the prismatic poetically evokes the snow and the ice that envelope the area in the winter—after all, Harbin is not called the Ice City for nothing. 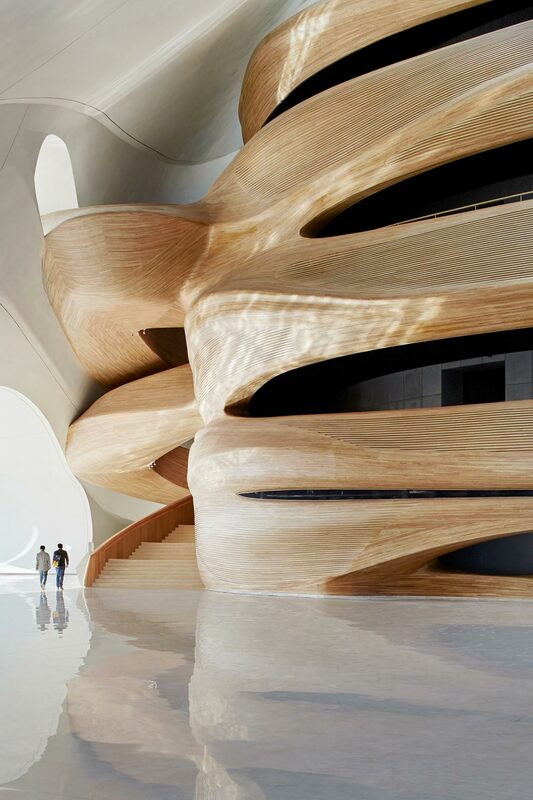 The exterior’s fluidity is also predominant in the interior spaces. 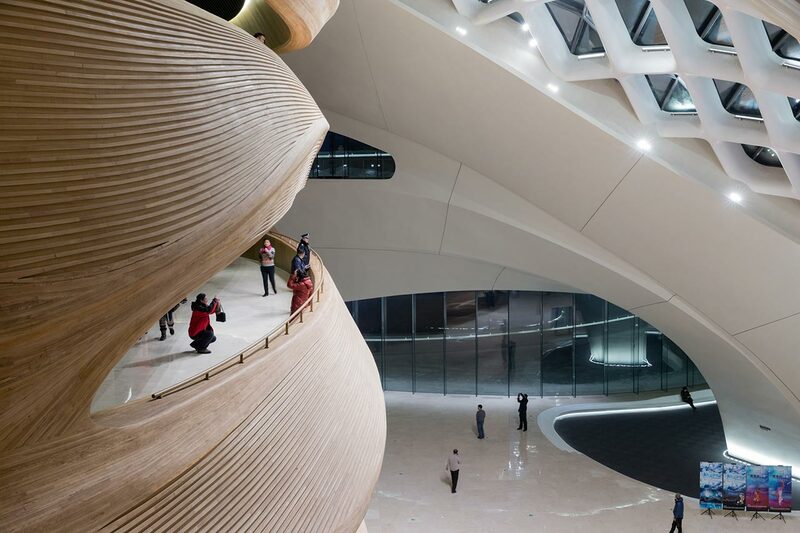 Upon entering the grand day lit lobby, you’re mesmerized by the billowing form of the lattice structure below the atrium roof and the immense wooden mass that contains the opera. 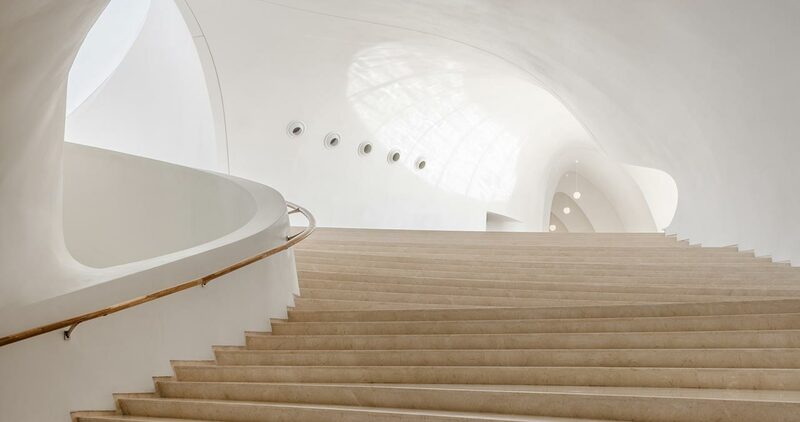 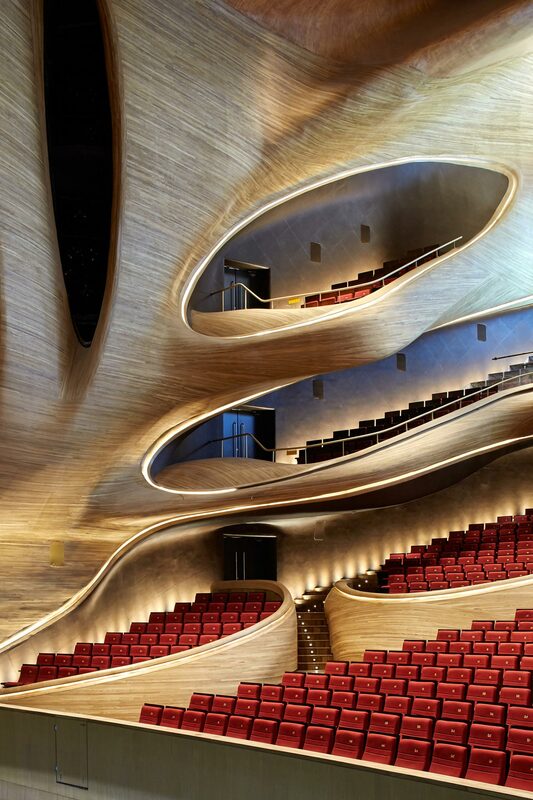 Sculpted from Manchurian Ash that elicits a warmth that is sorely needed in the ice-white interior, the sculptural volume of the opera is designed as per the architects to emulate “a wooden block that has been gently eroded away”. 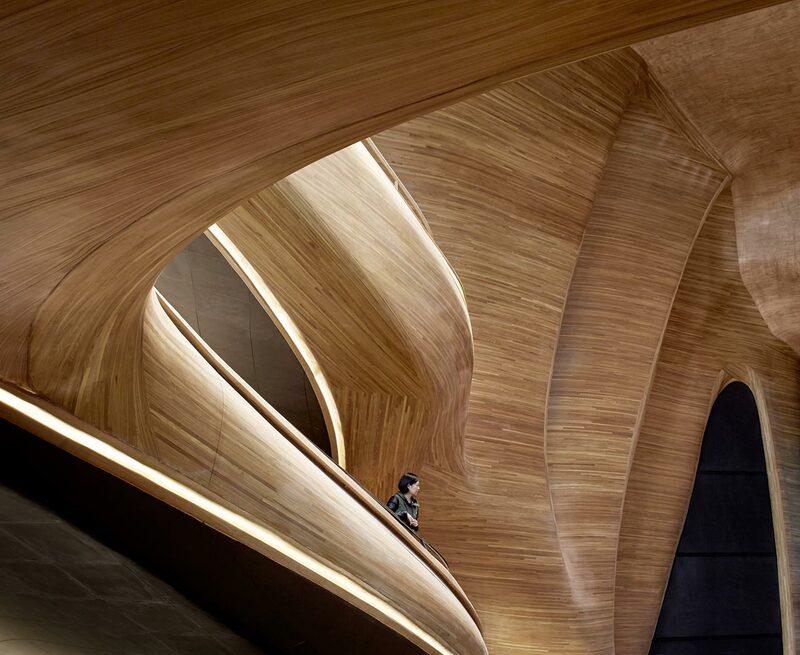 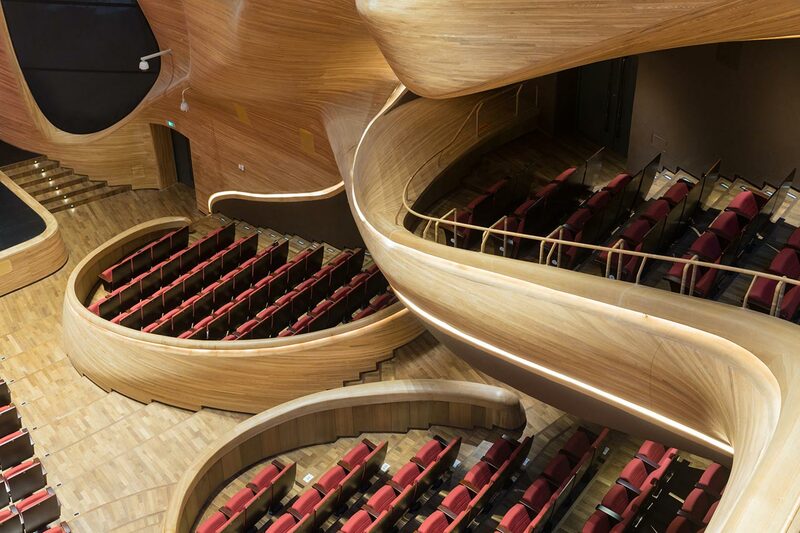 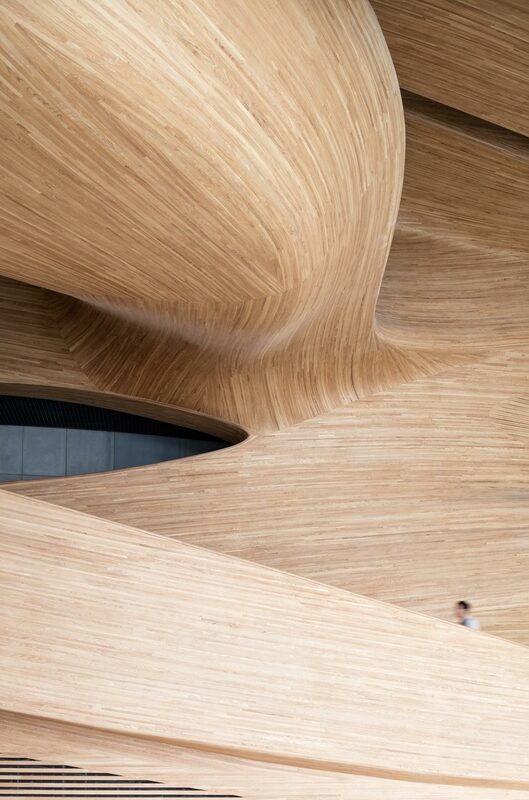 The sinuous wooden skin is also used inside the theater where it wraps around the stage and seating, all the way to the ceiling where, at the back, it surprisingly incorporates a skylight. 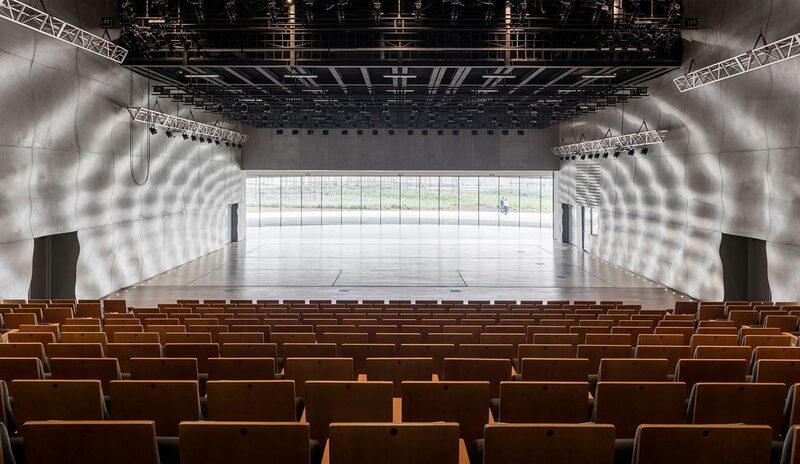 In contrast to the opera’s introverted design, the smaller theater opens up to the exterior through a soundproofed glass wall that acts as the stage’s backdrop providing spectacular views. 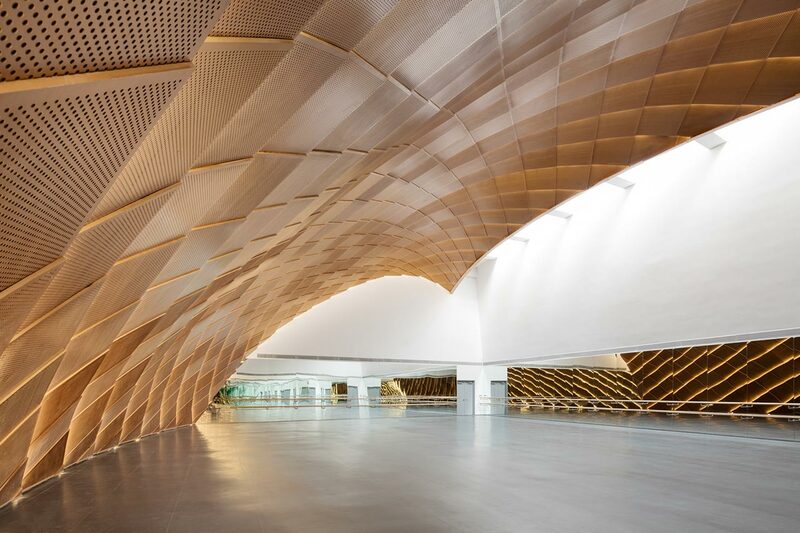 Although rectangular in plan, the space is far from regular as it features undulating walls, their ripples made all the more dramatic by the daylight flooding in through the glass façade. 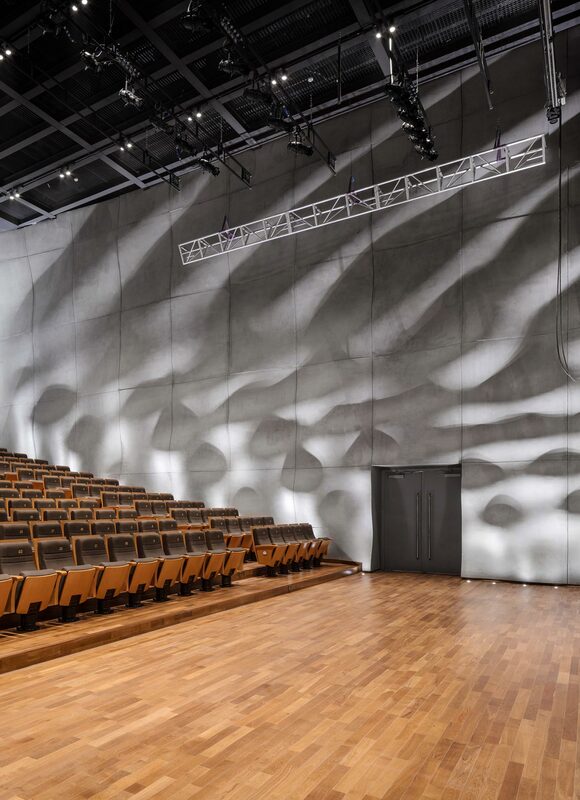 While the public plaza provides ample space for outdoor activities and performances, the architects have also designed a second exterior performance space located on top of the main volume. 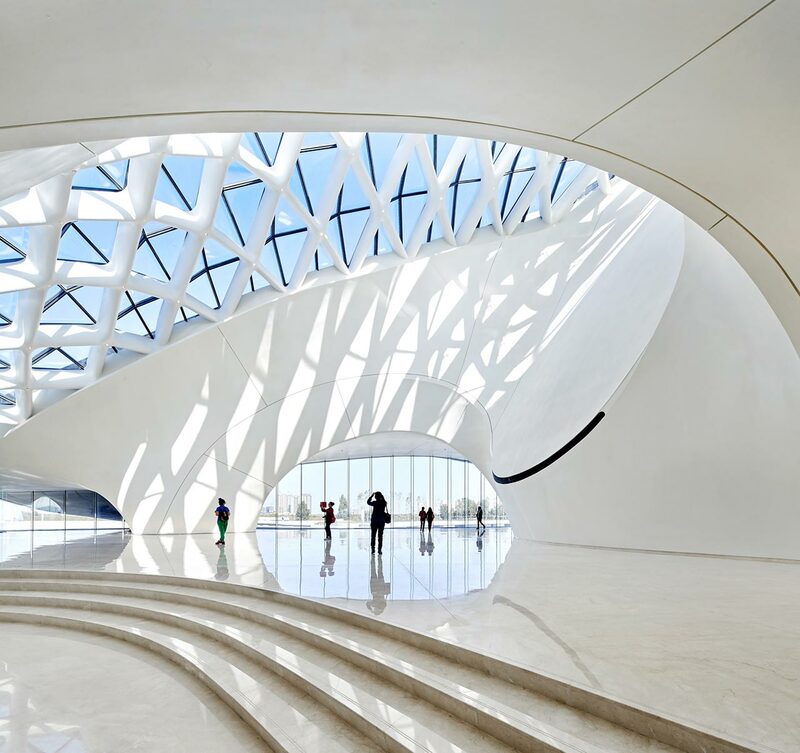 Accessible through curving paths along the building’s mass and open to the general public, the space, which doubles as an observation platform with views of both the city skyline and the surrounding marshlands, truly epitomizes MAD Architect’s philosophy of treating architecture as landscape.